I recently heard this episode of Marc Maron’s podcast WTF that set off fireworks in my head. Here’s a link. Rhett Miller is the guest and he talks very candidly about his life and experience as a musician. Rhett lived with artists and other passionate young creatives when he was younger and saw what a struggle it was for visual artists to make a living. He realized that music made more sense to him. It’s a lesson every artist learns. Being true to your vision and uncompromising with your artistic integrity is the most important value when you’re committed to a creative life. It’s the first commandment, and it’s your driving force. But the second creative commandment that Rhett figured out at a young age, is finding a medium that you can sell to make a living. The two commandments can co-exist, and it’s the responsibility of the artist to find that balance. This idea has shaped my creative pursuits. It’s the reason I started making books. Books are, as Rhett puts it, commodities that seem easier for me to negotiate. If you’re creative, you do commercial work, and it’s rare that commercial work respects artistic integrity. The creative people I know compartmentalize. They put commercial work in its own category and they do it in order to fund personal art-making. I do it myself. I’m a graphic designer and I take on commissions for artwork. We haven’t given up, sold out or compromised. It’s quite the opposite. We’re finding a way to make a living so we can continue creating autonomously. The goal for every creative person—the holy grail of the artist—is to work for a personal vision and make uncompromising work that finds commercial success on its own merit. No changes, no adaptations. It just sells itself. 1. What comforts can’t I live without? 2. How much money do I need to get them? 3. How do I want to spend my time? That’s the formula for every artist and it is a struggle. A non-artist doesn’t struggle with these questions. The non-artist who struggles with these questions is suppressing an inner-artist. If you’re an artist, you must find a way of living that supports your creative life, as much as your creative life supports your way of living. This is a beautiful and dynamic balance. It’s a state of bliss. How you spend your time becomes a habit that either helps you live in bliss or hinders your bliss. If you’re wondering how you’re supposed to know whether you’re doing something that helps or hinders your bliss, the answer is remarkably simple. If what you are doing does not help your bliss, it’s hindering your bliss. Yes, I have read Joseph Campbell. And yes, I know life has a habit of throwing curve-balls at bliss in the form of injury, sickness, disease, disorders, death and just plain bad luck. That’s why the life of an artist can be so hard. There are so many reasons for giving up and catatonically drooling at a continuous stream of videos until you shrivel up into an arthritic fist of sore wrinkles. As impossible as it feels to commit your life to art, living without art doesn’t just feel impossible for the artist, it is impossible. There is simply no other way to be. Likewise, making a living has no alternative. We’re all in the same boat. I’m going to conclude by saying something that only people who have committed to a life of art can understand: there is no such thing as a “starving artist.” The “starving” some artists do is superficial—they earn less, live simply and have few possessions. But what they gain is focus, commitment to a vision, and less time spent on distractions like expensive leisure activities and maintaining possessions. 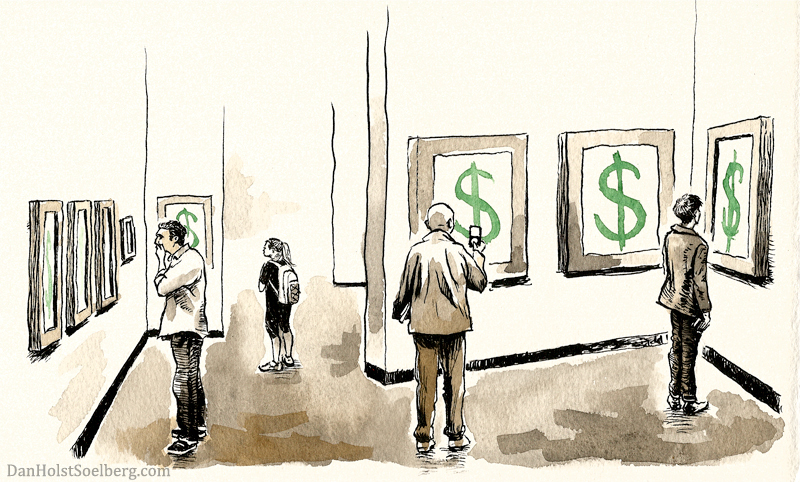 Without the liberties that money affords, artists are more resourceful and find more time to spend making art. Hard-working artists who really do starve are just like non-artists who starve: they lack opportunity, privilege, and resources necessary to navigate our capitalist system. They simply don’t know how to apply their skills in a way that is marketable. As Rhett Miller put it, they haven’t discovered a commodity that is easy to negotiate. Maybe you’re an artist who hasn’t yet discovered your commodity. So, how do you do it? I’m going to explore that throughout articles and interviews in the coming year. Stay tuned!